Now, that's not as bad as it sounds, really. This is what happens when other people (outside the faith) say what they think of Trip. "I am the ruggedly handsome Chief Engineer, Commander Charles "Trip" Tucker. I am from the South. This entitles me to have an amusing accent as well as over-react to every single crisis that Enterprise runs across. I am also the crew's designated Lady's Man. This is to counter-act the strong chemistry that exists between me and every other single male member of the crew, which the writers seem to have a lot of difficulty squelching." 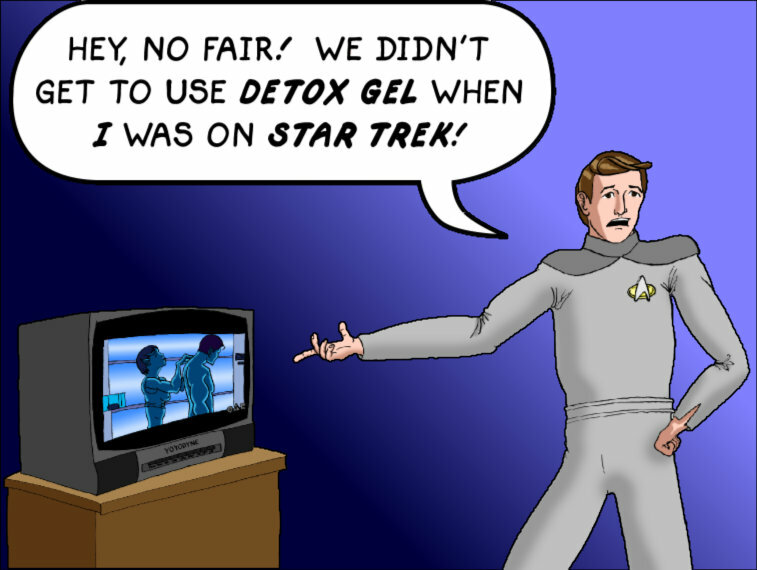 There was also this recent (8/19/2003) cartoon from Real Life: The Online Comic, done by the very talented Greg Dean. He agreed to allow us to host this one here! This proves that Trip Tucker exists beyond the confines of this website. Thank God! Many thanks to Redcat for the tipoff. Here's a Trip image made by the owner of Strekonline.com. Not bad at all. He made it as a "trading card" model. "Hello. I'm a normal guy. I'm a little shy around girls, but you can always rely on me to do the right thing, even if...gee whiz...I get a little confused sometimes. Hey, you look really nice in that sweater." These are from the mind of Jef Mallett, the creator of the "Frazz" comic strip. While they aren't exactly about Trip, they *are* about Trip. Look up that word, "callipygian". This litte gem comes from Jeff Lee's page; he nicely agreed to let us host it. Technically, it's Wesley Crusher, but Trip is Trip and decon is decon. Is it ever!